Been so busy recently have scarcely had time to post. Just got back from taking James to camp 🙁 My chief videographer and dessert innovator. I was in Boston talking salt on Simply Ming. I was in NYC working on confections with Bouchon Bakery head chef Sebastien Rouxel and putting together a pitch for a chef drama with some friends. I came home to find agreat new ice cream book from Ohio’s own Jeni Britton Bauer! Salt, sweets, ice cream, and an unused photo donna shot for the new book due out in fall: salted-caramel! Of course. 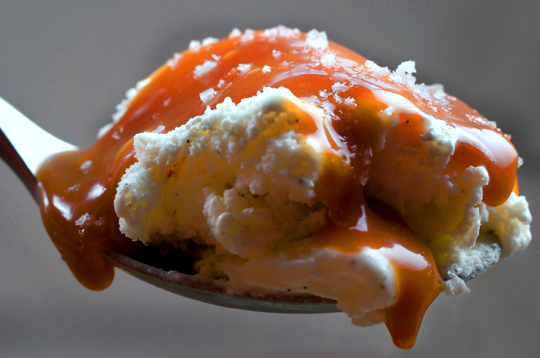 Caramel is one of those awesome no brainer dessert sauces that more people ought to do at home. Takes 10 minutes tops, uses inexpensive ingredients, and is easy ( just be sure to use a really big pot because when that cream hits the hot sugar, the water in the cream vaporizes and the volume in the post can rise three times its height. Want it richer? Add some butter before you add the cream. Sebastien and I were talking caramel and he likes to add lemon or passion fruit juice for variety to Bouchon’s caramels (add the flavor with cream). What puts caramel over the top though is the fine salty crunch of some fleur de sel—it both heightens the flavor and balances the sweetness. It also adds an appealing crunch. Salt and caramel are a heavenly pair. My advice for an awesome long weekend 4th of July dessert? Jeni’s vanilla ice cream, in James’s chocolate chip cookie bowl, with your own caramel sauce and a sprinkle of fleur de sel or maldon salt. Heat the sugar and just enough water to begin dissolving the sugar, a few tablespoons or so, in a large heavy-bottomed pan over medium heat. When the sugar is dissolved and beginning to brown, stir the sugar or swirl the pan to ensure even cooking. Keep in mind that the sugar is very hot and its burns can be severe. When the sugar reaches a beautiful dark amber color, remove from the heat and whisk in the butter, if using, followed by the cream. The caramel sauce can be stored in the refrigerator for up to one month, in a sealed container. When ready to use again, reheat to serve. My post on making vanilla sugar and its various uses. Jeni’s Splendid Ice Creams in Columbus, Ohio. A recipe for making caramel corn from Molly Wizenberg who writes the blog Orangette. Vegan strawberry ice cream recipe from David Lebovitz, blogger and author. Fat Toad Farm in Vermont makes goat cheese and a goat caramel sauce known as cajeta. Camp for nobel prize nominees? He should be a nobel prize recipient for that invention! Congratulations on all the awards for which Twenty has been nominated. (Are you sure I can’t end a sentence with a preposition?) It’s a lovely book in both print and e-form. Your everyday Coq au Vin is the best I’ve ever made. If the picture of the salted caramel in this post is a reject, the published picture must be really extraordinary. This salted caramel picture is outstanding, Donna! I’ve been making the salted caramel sauce in David Lebovitz, Perfect Scoop for a few years now. It is, hands down, a client favorite. I use it just over bananas at home or fresh cut apples. Fantastic. That vegan strawberry ice-cream looks good, although that kind of Rice Milk isn’t available in America, so I might do Coconut milk drink instead. This looks and sounds amazing. So, I’m heading off to the store to get the ingredients right now. Donna rocks!- that’s an awesome picture of an irresistible sauce! Spot on with this write-up, I really suppose this website wants way more consideration. I’ll in all probability be again to learn much more, thanks for that info. You really make it appear really easy along with your presentation but I to find this topic to be really something that I believe I would never understand. It seems too complex and extremely broad for me. I’m looking ahead in your next put up, I¡¦ll attempt to get the dangle of it! Hello there I like your blog site. Would you like to visitor publish upabout mine someday? If that’s the case please let me know by way of e mail or just reply to this particular opinion because My partner and my spouse and i actually enrolled in notifications and can realize if you do. Im no professional, but I imagine you just made an excellent point. You undoubtedly fully understand what youre speaking about, and I can seriously get behind that. Thanks for staying so upfront and so truthful. Hello I like your wewebsite. Do you want to guest publish on my own someday? If that’s the case you should inform me via email or just reply to this remark because We signed up for notices and can understand should you. The Zune specializes in being any Portable Advertising Player. Not a browser. Not a sport machine. Maybe down the road it’ll do better still in people areas, but in the meantime it’s an excellent way to organize and listen to your audio and video clips, and is actually without peer for the reason that regard. The iPod’s advantages are their web surfing around and applications. If those people sound additional compelling, perhaps it’s your best choice. I’ve recently started a website, and the information you provide on this website has helped me a lot. Thanks for all of your time & work. Hola! I’ve been reading your weblog for some time now and finally got the bravery to go ahead and give you a shout out from New Caney Texas! Just wanted to say keep up the great work! I honestly cannot think this situation like this kind of. I find myself that you have a reason for this. Thrilled to offer the capacity to play a role. Wish an individual luck. Howdy littermates simply enjoy your impressive site thanx and do not stop! Needed for you to send you that hardly any remark just to thanks all over again because of the spectacular techniques you might have provided in the following paragraphs. It’s thus particularly good with folks as you to produce unreservedly what many of us could possess marketed pertaining to book in order to earn some dough with regard to themselves, primarily considering you might have tried it once you wanted. The strategies also acted to get fantastic method to know that will everyone’s related desire in the same manner my personal to comprehend greatly additional regarding this problem. I’m sure there are 1000s of more attractive opportunities initially those of you that proceed through your article post. back very soon. I want to encourage one to continue your great work, have a nice day! Thanks in requital for shareing so much sterling informations. I’m impressed past the details that you own on your website. That’s joined of my favorite site. Thanks you joined more time. A great Hermes African american Tote are likely to be short on high-quality and they’re duplicated. It can also be rather quickly harmed as well as being produced hurriedly hermes medor clutch. You may also assess for those indoor in conjunction with observe the snags involved with place contained in the, that happen to be not necessarily beneficial efficient, oral cavity design well-known on initially Prada tote. Now there seem to be set lottery tickets and also features budget friendly resources.